The Dublin Biennial 2014 is the 2nd edition of the Dublin Biennial Pop-Up which first opened at The Point Village in 2012. The DUBLIN BIENNIAL 2014 is an International Contemporary Art Exhibition featuring the works of 55 International and National artists in a 15,000 ft space next to the Customs House at the CHQ Building in the IFSC, Dublin 1. Alongside the exhibition will run a series of FREE events including workshops, talks, documentary and experimental films. There will also be a number of ‘meet the artist events’ which are scheduled M-F 5:30-6:30. These will be announced on a day to day basis at the Gallery. The show will run from June 13th - June 22nd, with a private opening on June13th, and closing reception June 21st. The Gallery will be open daily from 12:00 - 6:30pm. This year 55 Artists were selected to exhibit representing 21 countries: Australia, Armenia, Brazil, Bolivia, China, Denmark, Ecuador, France, Germany, The Netherlands, Iran, India, Ireland, Italy, Japan, Switzerland, Turkey, UAE, UK, and the USA. Irish artists presenting this year will include Andrew Duggan, Hole, Meadhbh O’Connor, Biosphere, Belinda Loftus, The Wood and the Trees, Rachel Joynt, Saltway Series, Catriona McLoughlin, forget-me-not,and new works from Gwen O'Dowd, Speciman, Conor Walton, Bread, Helen Steele, Urban Jungle, Tommy Barr, Reclaimation, and Guggi who will present Pots I,II,III. International artists Included are Sonia Falcone (Bolivia), Gavin Turk, (UK) who were both recently represented at the 55th International Venice Biennale, Italian artist Carlo Gavazzeni Ricordi, (54 th International Venice Biennale), Brazilian Artist Christina Oiticica, German artists Deva Wolfram and Karla Sachse, American Artists, David Orr, Blinn Jacobs, and Chinese artist XinXin Zui. Gavin Turk is a British born, International artist best known for ‘re-using’ iconic art historical imagery, painted bronze and rubbish within his own work to make contemporary social and environmental comment. The Biennial will feature his works Trash and Colourful Trash. Other highlights at the exhibition include: Brazilian artist Christina Oiticica who will install a site-specific work ‘Seeds for Dublin’ at the Biennial along with an un-earthed canvas from the Amazon Rain Forest. Oiticica, who is married to the author Paolo Coelho, is known for her 'non-concretist' Land-Eco technique of combining paintings with the earth and the elements. Using the earth as foundation matter, Oiticica 'buries' her work in the earth for up to a year – the paintings, when unearthed, reveal the indelible marks contributed by nature to her works. She has buried her canvases in the Amazon, the Sacred Valley of Ganespurs in India, and along the route to Santiago de Compostela. German artist Karla Sachse will present Baskets of Experience for Dublin. Sachse weaves baskets and organic shapes out of newspapers. Her objects are interwoven with the local daily news stories, each piece relates to the place where it is woven. Passers-by are invited to write their stories and these tales are integrated in the final pieces, their handwritten contribution visible but illegible. For the Dublin Biennial 2014 Karla will sit for the week weaving little bowls from current Irish newspapers and the handwritten notes of visitors to the Dublin Biennial. German Botanist and artist Deva Wolfram will prepare her Wild Plant Buffet for the Biennial’s Solstice party on June 21 st. Wolfram’s botanical research focuses on the City, where she sees an increase of unusually rich wild flora. Due to climatic changes, contamination and industrial farming in the countryside, cities now offer a refuge to many short-lived plants that then propagate abundantly. The result of Wolfram's intensive research is a wild visual and edible feast. She has prepared her acclaimed Wild Plant Buffet throughout Europe, in Bonn, Düsseldorf, Florence and Rome. As part of her preparation for the Dublin Biennial Wild Plant Buffet, Ms. Wolfram will conduct workshops and forage Dublin for native wildlife plants. She will be joined by Niall O’Sullivan, Head Chef at Isobel’s Restaurant and Founder of Nádúr Collective, Niall will present ‘a taste’ from the wild side. 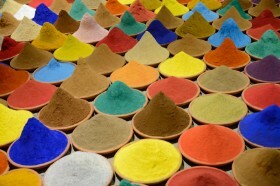 Sonia Falcone, Campo DeColor – from the 2013 Venice Biennale.